On one of his visits to the house of two-time BJP MLA from Silchar, late advocate Bimalangshu Roy, former Prime Minister Atal Bihari Vajpayee was quick to respond to have Bengali dishes served during lunch time. It was in the year 1985 when Vajpayee had some rallies lined up among many of his rendezvous with this place. This was late Vajpayee’s second stopover at this house and he even spent a night out here to move around the three districts of the Barak Valley. With the curtains coming down following the death of former Prime Minister Atal Bihari Vajpayee on August 16 last and cremations the next day, Northeast Now travelled to this house on Saturday to know more about former PM Vajpayee and his association with another dynamic leader of Silchar, late Bimalangshu Roy, who died in 2009, and now, that house is looked after by his elder son and Assam State BJP spokesperson, Dr Rajdeep Roy. The entry gate still bears the name – Advocate B Roy. 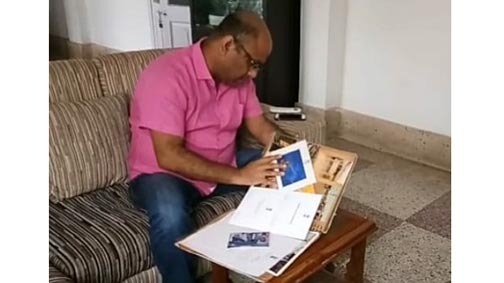 Upon entering the house, this correspondent too could catch up with Dr Rajdeep Roy in his drawing room going through the photographs and letters sent by late Vajpayee to his father. Though somber, and emotions riding high, Dr Rajdeep Roy showed many letters, greeting cards and photographs of his father with late Vajpayee and even with other political stalwarts of this region. “A massive crowd blocked our path in between, but without hesitating, he opened the back door glasses. The crowd jumped in to touch him, shake hands with him. Atal ji was aware that a Doordarshan Kendra was set up in Silchar a few days back by then Information and Broadcasting Minister Ajit Panja. In his witty way, he told the crowd to stay away and said ‘Doordarshan’ instead of saying to stay far from him. Such was the nature of this person,” said Dr Rajdeep Roy. Dr Rajdeep Roy became not only nostalgic, but, his memories of late Vajpayee and his father late Bimalangshu Roy made him emotional and dropped tears too.